4 Qualities of EXCEPTIONAL EMPLOYEES HOW TO BUILD A TEAM THAT WILL WIN BIG No Matter its Size IS YOUR PHONE VOICE ATTRACTING â&#x20AC;&#x201D; or repelling? don’t want to hear from a roofing company every day. So how do you produce fresh and interesting content for social media that goes beyond your core services and yet ties back to your business? you extend your social media presence and content to include personal things (like your hobbies) and how does that affect your overall business image? others can join in the cause. Then it becomes a huge win for all. 2. HOBBIES You bungee jumped from four of the tallest bridges in the U.S. In your spare time, you go fly fishing. You love playing chef and use only locally grown, organic foods. Your friends are always begging you to go to Vegas with your card shark talents. You’ve done mission work in Africa and would like to start your own group. You almost played professional baseball. You have an insane talent for gardening design or bass guitar. Your family works at a soup kitchen once a month. Ok…you get the picture. And two more words. Reality TV. People are interesting…and people are interested in interesting people. We remember others based on these unique traits. And most of all, people love the story behind the face. Don’t be afraid to share your hobbies. Quite often, it’s the first thing that will personally connect you to a prospect. the type of flower and type of environment needed to make it flourish (moist soil, full sun, etc.). And then, of course, watermarked it with your logo….and a title like, “Sam’s Daily Reminder: It’s Time to Stop & Smell the Roses”. You could even include some great, thought-provoking quotes. It has the personal connection (Sam), the business connection (flowers & logo watermark) and a cool creative connector (pause the meetings and paperwork to take a moment and appreciate life by noticing this beautiful flower). This is a great idea for staying ‘top of mind’ and connecting business with the kind of creative messaging people wouldn’t mind seeing every day. ideal customer are an opportunity to connect beyond the business world. And when we do that, we become a part of the family. 5. INFLUENCERS “Show me your friends and I’ll show you your future”. You’ve probably heard that saying, and the same is true whether you are a teenager or a business owner. Maybe you’ve learned a lot of your business knowledge from Bill Gates, Steve Jobs or Warren Buffet…or you like to quote Benjamin Franklin. Perhaps you have some mentors you’d like to recognize and tell why they’re important to you. Sharing the people and things that influence us is what makes us human. No matter how successful your business, you didn’t get there alone. People and circumstances shaped you along the way. Recognizing others for their contribution in our lives, large or small, is important in staying connected and grounded. We hope these five types of content help you to put a fresh spin on what you share with your audience, whether personal or professional. We believe you must have the combination of both to build an incredible brand. Kathy Helbig Owner, CEO and Broker at Experience Realty Partners in St. Louis, Missouri—a premiere boutique firm— oversees a dedicated, professional team of twenty-plus, and services all of St. Louis and St. Charles County. 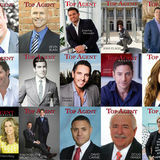 accolades – including receiving the Agent of the Year Honor - is evidence that she and the entire Kathy Helbig Group have become recognized within the industry as a force to be reckoned with. To find out more about Kathy Helbig, call 314 - 276 - SOLD (7653) or visit KHGexperience.com www. polish your ‘phone voice’? It’s probably the first ‘warm’ impression people get of you (I call email ‘cold communication’ because it vastly shrinks the three major ways we communicate: sight, sound, and feeling). Here are three tips to assure your phone voice makes the best first impression. Remember, You never have a second chance to make a first impression! For three days, listen carefully to the tone, intent, and messages you hear in phone messages. Listen carefully to how agents, managers, and your affiliates answer the phone (including the receptionist at the office). What do you think? If you didn’t know these people, what would you think of them? Are they excited to hear from you, or are they bored? Here are 4 important tips to remember when recording your own message: 1. Stand up—you’ll sound as though you have much more energy. 2. Write out your script first—and be sure it’s not too long. I don’t really care where you’re going to be all day! 3. Modulate your voice pleasantly. Try to get some resonance. 4. Sound as though you’re looking forward to hearing from me! Advice from a musician: Practice your phone message several times before you record it. Then, record and listen critically. Don’t just use the first recording. Make sure your ‘phone voice’ is the best first impression you can make.